Artificial intelligence is on the job every day at financial services companies. With AI, companies are improving customer experience, warding off fraud, mitigating risk and more. As financial services institutions (FSIs) face new regulations, rising customer expectations and disruptors around every corner, they are embracing digital transformation to prosper and stay competitive. One of the ways in which FSIs are transforming themselves is through the adoption of artificial intelligence. Increasingly, FSIs — including commercial banks, investment firms and insurance companies — are using AI to address some of their most pressing challenges. With today’s AI solutions, FSIs are improving customer experience, reducing fraud, predicting customer needs, protecting confidential data, and maintaining regulatory compliance. Let’s consider a few of the more common use cases for putting the power of AI to work in the financial services industry. Risk analysis — In the aftermath of the 2008 financial crisis, FSIs have been subject to increased regulations for controlling risk. One way they do this is by using AI to simulate huge numbers of parallel market scenarios over large portfolios. These simulations require intelligent algorithms and an enormous amount of computing power. In addition, FSIs are using automated systems to compare what’s happening now with benchmark data for normal behavior, so they can spot risks in real-time. These steps lead to better outcomes with reduced effort. Fraud detection — Highly sophisticated, always-on fraud detection is a requirement for day-to-day business in the financial services world. Al is at the heart of these efforts. For example, smart algorithms help banks identify unusual transactions that could be fraudulent — so they can put an immediate stop to those transactions. Similarly, insurance companies use AI to spot suspicious claims by comparing new claims against the patterns and specifics of legitimate claims. Cyber security — FSIs continually face malicious threats from hackers, thieves and defrauders, as well as unreliable insiders. To ward off these threats, they leverage a wide range of tools for protecting the security of data and systems. One of these tools is AI, which is used to detect suspicious behavior and other anomalies — so security teams can stop threats as they emerge. Even better, FSIs are now using machine learning to enable threat-detection systems to learn from their experiences and get better over time. Trade optimization — For algorithmic and high‑frequency trading, AI helps firms make better, faster decisions on the trading floor. 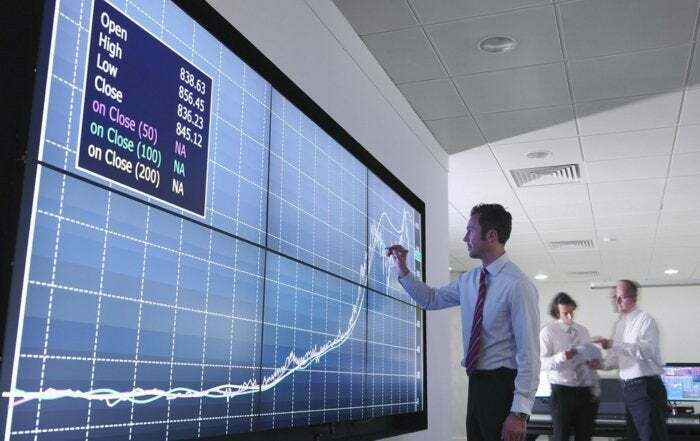 For example, AI helps investment firms and trading desks identify patterns and trends in data and make predictions about the future, so they have a better sense of the direction and volatility of a stock price. Credit risk assessment — In mortgage and retail banking, AI helps FSIs make better decisions on the credit-worthiness of applicants while greatly accelerating the process of credit risk assessment. As the research firm McKinsey & Company notes, “With machine learning and other technologies, risk models can become more predictive, which suggests that credit losses may fall by up to 10 percent.”1 Even better, McKinsey notes that over half of risk managers expect credit decision times to fall by 25 percent to 50 percent with the power of AI on the backend. Marketing optimization — With AI systems, FSIs can more easily cluster or segment customer behavior to better serve and sell to “like” groups. AI can also help FSIs personalize the customer experience. For example, they can use AI to mine transaction history, social media sentiments, and other structured and unstructured data to anticipate a customer’s needs and objectives in real time and offer customized services. Automated customer service — In the customer-contact arena, FSIs now use voice analytics to increase customer satisfaction and reduce churn. These initiatives capitalize on advances in voice-recognition technologies, data analytics and AI algorithms. Systems can now detect not just the words customers use but also the tone and sentiment behind the words. These capabilities help FSIs automate both customer interactions and quality-assurance monitoring. Regulatory compliance — A wave of new regulations has washed over the financial services world in recent years. For many FSIs, achieving compliance with new and existing regulations is no easy task, especially if they rely heavily on yesterday’s processes. New AI-driven processes offer a better way forward. AI can help organizations automate the process of identifying, collating and analyzing data from disparate systems to meet compliance requirements. Mastercard is among the payment-processing companies fighting back against fraud every second of every day with a war chest filled with sophisticated technologies. One example: To identify and stop fraudulent transactions, Mastercard leverages machine-learning algorithms running on HPC systems to process large data sets nearly instantaneously. This capability helps Mastercard stop fraud in its tracks without disrupting or delaying legitimate transactions. While that’s a challenging proposition for any company, the scale at which Mastercard operates makes the problem all but unfathomable. In round numbers, Mastercard has 2 billion cards in use in more than 210 countries and territories. It processes 165 million transactions per hour, using machine-learning algorithms and applying 1.9 million rules to examine each transaction. It all happens in a matter of milliseconds.2 None of this would be possible without AI working quietly in the background — at lightning-fast speeds. In the world of financial services, AI is transforming everything from risk management and cyber security to high-frequency trading and customer interactions. Along the way, AI is empowering FSIs to make smarter decisions that drive better outcomes. The bottom line: AI is very much the future of the financial services industry — and that’s something you can bank on. 1 McKinsey & Company, “The future of risk management in the digital era,” December 2017. 1 Dell EMC white paper, “Fighting fraud the smart way — with data analytics and artificial intelligence,” December 2018.